Provide comfort for the family of Paul Wilson with a meaningful gesture of sympathy. 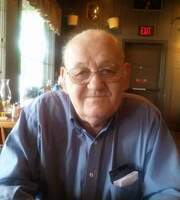 Paul Wilson, 78, of Battle Creek, Michigan, passed away on Saturday, March 9, 2019. He was born on March 12, 1940, the son of the late Woodrow Wilson and Enid (Uren) Wilson. Paul worked as a security guard and most recently for Securitas until his retirement. He dropped out of high school to join the US Navy; he served his country for 13 years, during the Cuban Missile Crisis and Vietnam. Paul loved to dance and that is how he met his wife, Freda. Paul is survived by his wife of 21 years, Freda (Cyphert) Wilson; brother, Roger (Ann) Wilson; sister, Joyce Zygiel; 3 daughters, Beverly (Richard) Burghdoff, Barb Starr and Mary (Richard) Shultz; son, Ted Barnes; 9 grandchildren and 1 great-grandson. He was preceded in death by his parents; brother, Larry Wilson and sister, Janet Taylor. To send flowers in memory of Paul Wilson, please visit our Heartfelt Sympathies Store.